Summum Malum is our attempt to pinpoint the possible identity of the threat the Master Chief will face during the events of the Reclaimer trilogy. As of this moment, we have very little concrete information about the events of Halo and onward except for the fact that, during the events of Halo 4, the Master Chief will come face to face with anew enemy – an “ancient evil” possibly locked up in the mysterious dark planetoid seen during the Legendary ending of the original Halo trilogy. In this series we’ll take a look at a number of possible candidates for the position of “ancient evil” whilst we wait until such times as it is revealed to us. This article contains spoilers for Halo: Primordium. Over 100,000 years ago, a dying human known as Chakas was imprisoned in a Forerunner AI housing chassis–when players are first introduced to him, he goes by the designation “343 Guilty Spark”. While some of Spark’s inner monologues suggests he volunteered for his conversion, at other times Spark’s testimony (that of Primordium seems to contradict this, saying he was forced to abandon his biological body in order to command a Halo installation. After a hundred millenia spent alone, anyone, regardless of mental capacity, would begin to go insane. And so Chakas/Spark, confined to the caretaking of Installation 04 following the Halo Event, proceeded to do just that. Indeed, the protocol which guided his actions required him to remain non-communicative even when potential communication landed on his installation. A few thousand years later, the arrival of a second species directly results in the defiance of protocol and the destruction of Spark’s installation. “Vexation! 100,000 years of careful maintenance and diligence. 100,000 years of protecting the galaxy’s future. 100,000 years of fearing our sacrifices–my sacrifice–was in vain. And 16 hours after I finally make contact–this so-called ‘Reclaimer’ decides to blow it all up. For most, this would be enough to cause a murdering rampage, but Chakas/Spark held his cool. Months after the destruction of his responsibility he helped the humans defeat the Flood, eventually finding his way to the Ark where he discovered a waiting replacement for his installation. His plight seemed to be coming to an end… but the same so-called Reclaimer not only blows up his replacement installation, but destroys him as well. Motive–After millenia spent alone, his descendants are trying to ruin everything he’d been working for. As detailed in the Anniversary Terminals, Spark is very much a personality divided. First forced to share his mind with the geas of a defeated human commander, Spark was then pressed into service aiding the Forerunners. His allegiance by the time of the Halo trilogy appears to be clearly towards the Forerunner’s plans. If he comes across the Chief again, he would likely like to dispose of a serious nuisance. Spark was evidently not finished by a Spartan Laser blast to the eye. 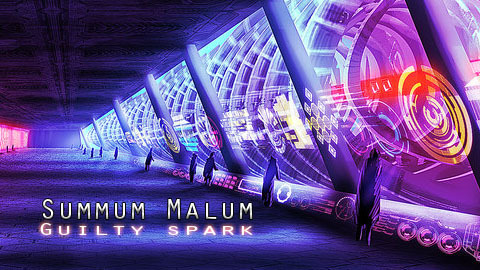 In Primordium, readers learn that Guilty Spark, much like his installation, had been downloaded into a replacement housing. At the end of the novel, he forcibly takes command of a UNSC ship, hightailing it to find the Librarian–whom he believes has survived her apparent death 100,000 years earlier–to possibly commit some cosmic tattle-taling. Once in the caring hands of the Librarian, who knows what sort of abilities will be bestowed upon him and what sort of installations he will be granted control of. A Lifeworker of significant influence, it would not be too surprising for her to side with Chakas against the humans (who have developed a reputation for opposing the Mantle which all Forerunners stand for) a character whose destiny she helped to influence. Means— He has command of a human ship and seems to know something we do not. The Master Chief has already seen what Spark is capable of as he commanded an army of deadly Forerunner sentinels on Installation 04. Additionally, Spark can be a sly manipulator – almost convincing the Chief to activate and fire Installation 04 and using the Covenant’s zealous devotion to the “Great Journey” to achieve the same ends. Guilty Spark cannot be trusted, as the captain of the ONI vessel found out in Primordium as Spark distracted the crew with a history tale whilst subverting control of the ship for his own purposes. He may not have the booming voice of an ancient evil monster, but his calm and polite greeting may herald the return of one of the galaxy’s greatest threats. The so called Librarian is on requiem. Didn’t really sound like Spark, did it? Maybe his new housing gave his vocals a villain upgrade?